but it’s 10:30 pm and I’ve recently learned that life is, in fact, a whole lot better when you’re getting adequate sleep. Far fewer bad days and meltdowns over nothing. So, I gots ta hit the pillow. I’ll be back soon. Bon nuit! Today, we got news that Osama Bin Laden has been killed. Part of the world mourned and part of the world rejoiced. Nearly 10 years ago, we watched in helpless terror and sadness as we got news that terrorists had used innocent victims to kill more innocent victims. Part of the world mourned and part of the world rejoiced. We’re not so different from each other after all. Faith, religion and belief will always be personal decisions, really, when it comes down to it. They are all merely different languages telling the same story: None of those stories preach cruelty, fear and pain. The stories strive to teach us love, compassion and forgiveness. “Darkness cannot drive out darkness: only light can do that. Hate cannot drive out hate: only love can do that.” – Martin Luther King, Jr. 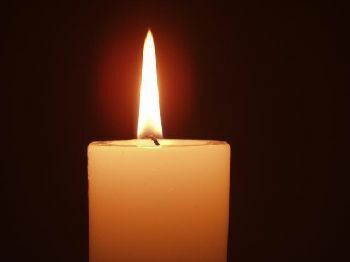 This candle is not in any one man's memory; rather, for all of humanity, in memoriam, in present and for the future. I hope that light will burn away the dark.